I'm looking for a bit of help in using a small mains voltage electric motor as a small dynamo to be driven from a steam engine. Admittedly the spec says 5200rpm and I'm only so far running it in my lathe at about 1100rpm but I'd have expected a glimmer of light ? As it is an AC 240v mains motor presumably it will supply AC? Do LED lamps need DC ? Most LED's are DC, if it is a car light, definitely DC. If you have a voltmeter, try hooking that up to see if you are generating anything at all with the motor (on AC setting, I would assume). As for what it takes to make a AC motor generate electricity, that is way too long ago to my AC circuits classes! Unfortunately I don't have a Voltmeter, I'll see if I can find a torch bulb to try tomorrow. If you google 'generate electricity from ac motor' you will get a bunch of articles on it. Does this Motor have magnets (in other words, is it a dc motor) or is it a universal motor with field windings? 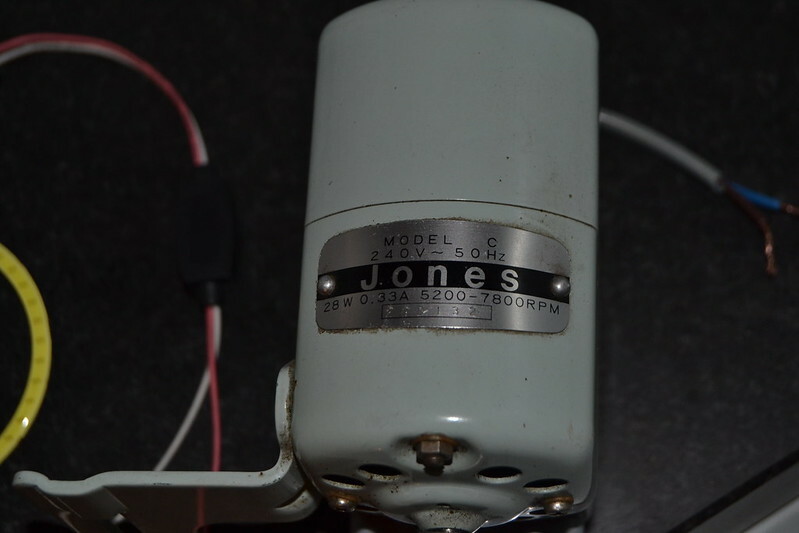 Thanks, I suspect it is an AC motor, it came of a mains powered sewing machine. By the Way: you should look for a motor with low rpm to get some useful voltage out of it. The lower the rpm per volt rate is, the more volts you get when you drive it with a steam engine. 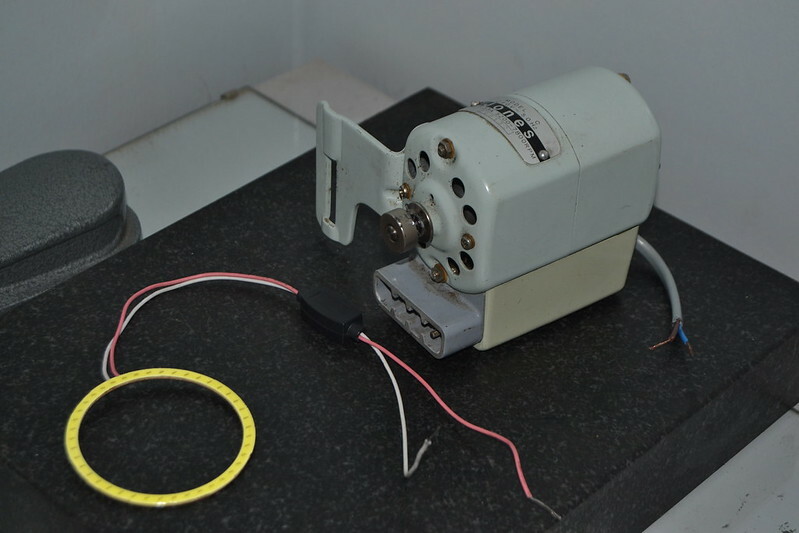 This motor looking like a universal motor can run on AC or DC it is however serie connected and can be a generator but the load must be attached to it to put out voltage. Some my not have enough residual magnetism to do that only trying it with a load will tell. Good luck! Hi Peter, I would suggest a car headlight, even LED type, as a test load would be a bit like trying to power a large truck with a motor scooter engine. You need some little LED's from an electronics supply outlet, about 10c ea, and a small collection of resistors. And I suggest that you really need a digital voltmeter to work out what's going on. A cheap voltmeter will do, but it will not be long before you want a very low voltage scale, say mV, and one with a thermocouple for measuring your steam conditions, both available in relatively low cost meters these days. Get some 1ohm resistors and a five ohm as a load for your generator and measure the voltage across them for current using ohms law. A normal LED has a forward voltage drop (when it lights up) of about 1.2 V, but needs a series resistor to limit the current to something in the range of 1 to 20 mA so as not to burn it out. So you need to know the maximum likely voltage to calculate the required resistor. Once you are getting some output, you can measure it and then see what you can do to increase it to something more useful. Or just power a string of LED's. From the photo I can see that there's a four pin socket under the motor. I presume for the foot operated speed control. I also noticed a cable at the back with two wires. If you're looking for a voltage from that wire you're not going to see one because part of the circuit is missing/open. Are you able to remove the box with the socket attached? If you can you should be able to see the wires that go into the motor itself. As Don has pointed out it's a small " Universal " motor capable of being run from either AC or DC. Hopefully there will be just two wires going into the motor body itself and it's those where you'll need to attach your bulb to. Don't forget that some LED lamps are " polarity conscious " and your motor will be outputting DC when driven, this is where a cheap voltmeter would come in handy. Alternatively find an incandescent bulb of reasonable wattage instead. Forget it, the easiest to find is a small DC motor (old printers and that sort of thing), or find any small motor With permanant magnets either stator or armature, if it has brushes you get DC, if it's brushless AC. If you get adventuristic you can do some modifications to a motor, and turn it into an alternator. I took a small shaded pole motor, and remove the armature, and made a new one similar to the shape of one in an automotive alternator, but with a magnet inside the claws of the armature. I did cut the shading rings on the poles of the motor, but there was little if any difference in the output of the alternator. This is suitable for driving from one of my hot air engines that has a shaft power of about 5 Watts at last test. This is only one of about half a dozen generators / alternators that I use on my motors. Many thanks for all the replies, it's given me a few things to think about. I think Graham may have hit the nail on the head in mentioning there would have been a foot operated treadle attached and in the present state the circuit may be incomplete. I'll have a bit of a play around over the next few days and see what I can manage. I have a vertical engine near completion and bought the motor as an impulse buy thinking it may be worth trying to get it power a small bulb etc, it only cost £3 so if it doesn't work its no great loss. You may have looked already, but there is a generic wiring diagram available on the net. This is one of many similar ones. Thanks guys I realise now that an LED may not be the best light to use as a test so I'll get hold of a bulb and do further tests in a few days but it looks like my idea of powering a small lamp isn't really possible without getting involved in modifications etc. It's probably worth me buying a cheapo multimeter tho, there have been a few occasions recently where one could have been useful. Just as a matter of interest, has anyone got a Stuart or a PMR dynamo? I rather like the retro look but the Stuart seems hideously expensive at over £200 for the castings I'm sure with a bit of thought it can't be too difficult to make one for a lot less. Bad Behavior has blocked 15399 access attempts in the last 7 days.